Austin Family Chiropractic celebrates 10-yr Anniversary of Utilizing Cold Laser Therapy! This month, Dr. Todd Austin of Austin Family Chiropractic in Virden, IL celebrates 10 years of bringing the healing power of LIGHT to central Illinoisans via the state-of-the-art healing modality known as COLD LASER THERAPY. It all started for #DrTodd back in June 2004 when he first saw a demonstration on Cold Laser Therapy while at a Chiropractic seminar. He was thoroughly impressed and his interest was peaked! At that time, getting started with Cold Laser devices suitable for clinical use was an expensive proposition which required spending a minimum of $4,000 and quite often much more. So Dr. Todd saved up the money over the following 13 months while learning all that he could about Cold Laser Therapy (aka Low Level Laser Therapy or simply LLLT) and investigating which laser units would be best for taking care of his patients in his Central IL chiropractic wellness practice. 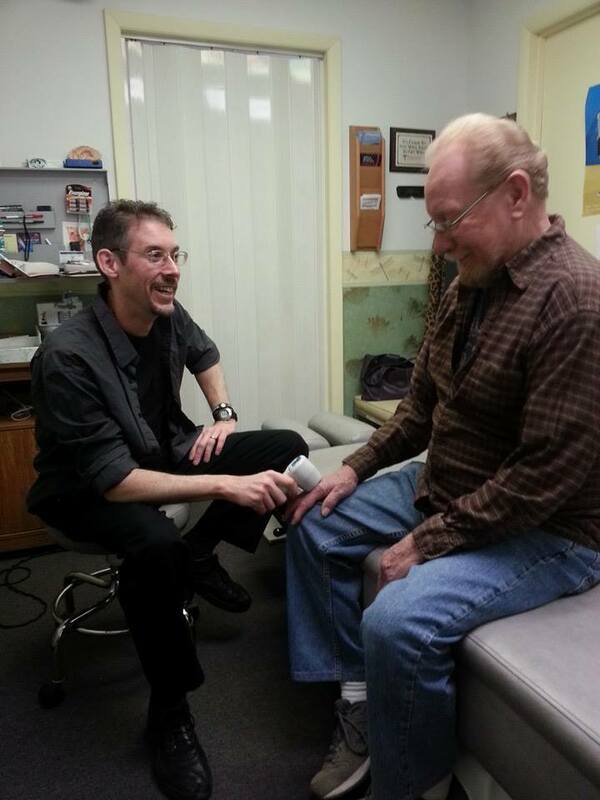 Here Dr. Todd lasers a gentleman for severe chronic hand pain. Dr. Todd Austin performing cold laser therapy on a patient’s hand for pain associated with arthritis. And here’s his testimonial video. On July 15th, 2005, Austin Family Chiropractic’s first 3 cold laser units arrived. Within a couple of weeks, Dr. Todd was using them regularly on many new and established patients and getting some amazing results! To date, Dr. Todd has performed over 21,000 cold laser treatments over the past decade. 85% of his LLLT patients experience noticeable pain relief within 3 to 4 hours of even their 1st treatment (with or without chiropractic care). Dr. Todd has since developed a great reputation for using his various lasers to deal with chronic pain and enjoys getting tough cases referred to him specifically for LLLT by other chiropractors in Carlinville, Chatham, Jacksonville & Springfield as well as some Springfield M.D.s. 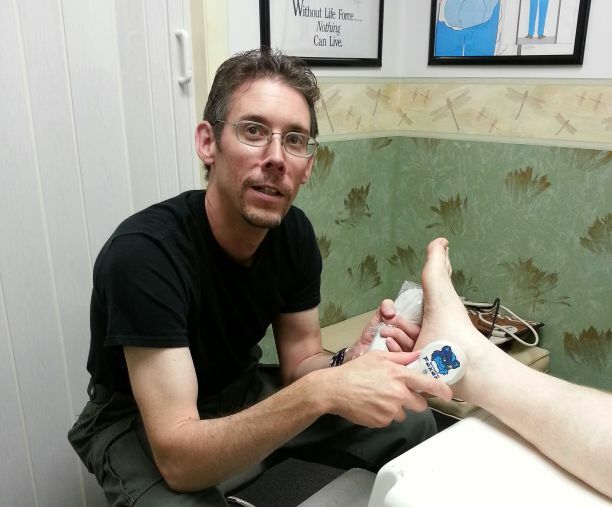 Here Dr. Austin is performing cold laser therapy on a gentleman with painful foot neuromas that his podiatrist really couldn’t help him with. Here is a testimonial video from M.J. Hers was the very 1st tough shoulder case that Dr. Todd solved with his Cold Lasers in July of 2005. And here Kelly who calls Dr. Todd’s cold lasers his “Magic Wands” talks about how a combination of light force chiropractic care and LLLT saved her from neck surgery. Then in 2010, Dr. Todd formed a Cold Laser Consulting business where he trains other holistic doctors around the United States and Canada how to successfully implement LLLT into their practices without breaking the bank. He has successfully trained a few dozen clients mainly fellow Doctors of Chiropractic along with some M.D.s, P.T.s and Massage Therapists throughout 15 states and 2 provinces since that time. 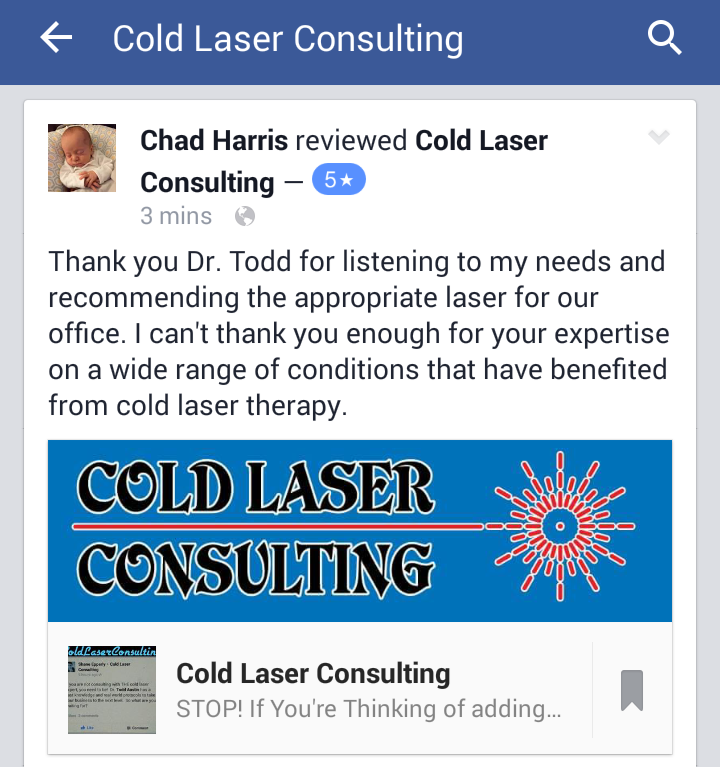 Here is one of Dr. Todd’s Cold Laser Consulting testimonials from a Canadian client. 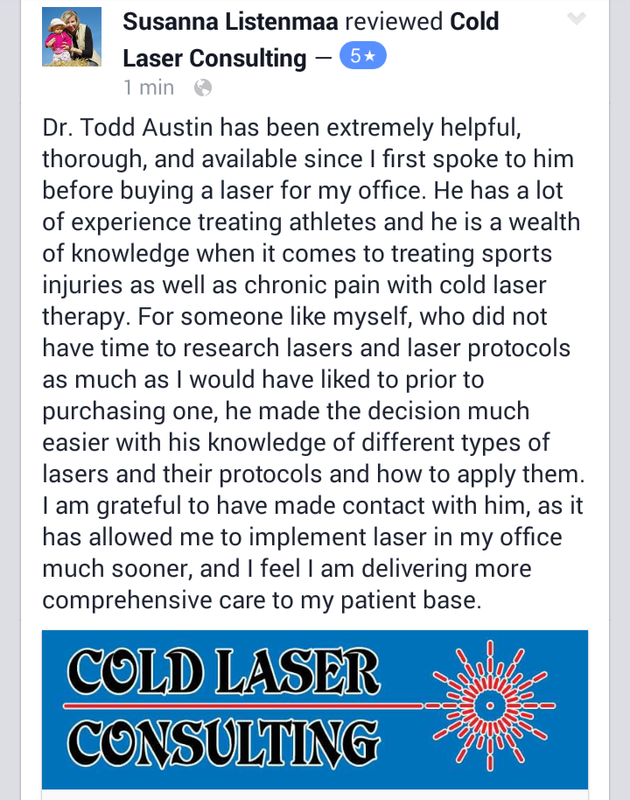 Here is one of Dr. Todd’s Cold Laser Consulting testimonials from a Georgia D.C. Since 2005 Dr. Todd has added several cold laser units to his practice as the technology has continued to change. For example in professional hockey the past 6 Stanley Cup Championship teams (Chicago Blackhawks 3 times, L.A. Kings twice & Boston Bruins once) have all benefited from their Team Trainers using LLLT to both treat and prevent injuries of all sorts. Dr. Todd now utilizes the same laser devices those teams all use in addition to several other units as well. 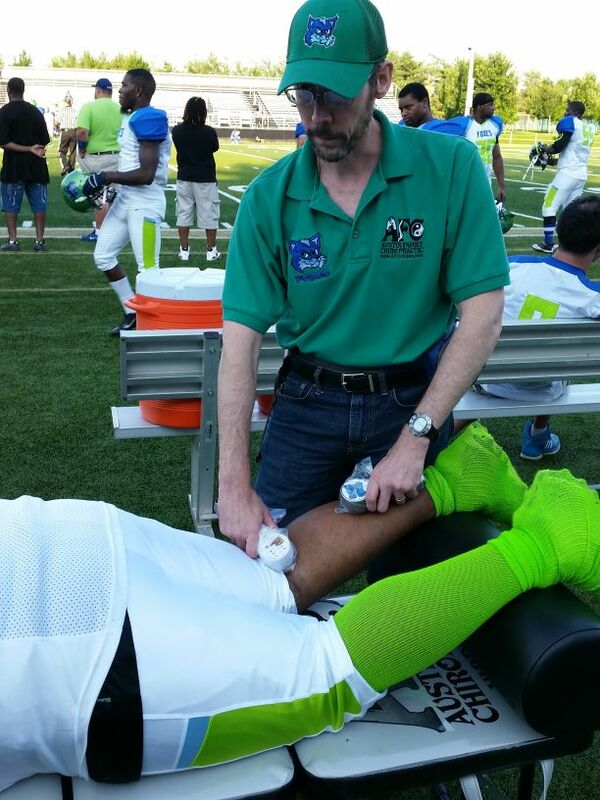 In 2011, Dr. Todd & his wife Eugena B. Austin Licensed Massage Therapist joined the Springfield Foxes semipro football team sideline healthcare staff with Todd serving as Official Team Chiropractic Physician and Cold Laser Therapist. They spent 5 seasons with the team from 2011 through 2015. Some game nights, Dr. Todd cold lasered upwards of 15 to 20 players on the sidelines while caring for a variety of sports injuries (calf sprains, torn hamstrings, turf toe, Achilles sprains, a plethora of knee and shoulder injuries, pain associated with a fractured wrist or hand, elbow contusions, lumbago, sciatica, stingers, etc.). Dr. Todd Austin cold lasering a calf sprain injury on a semipro athlete. 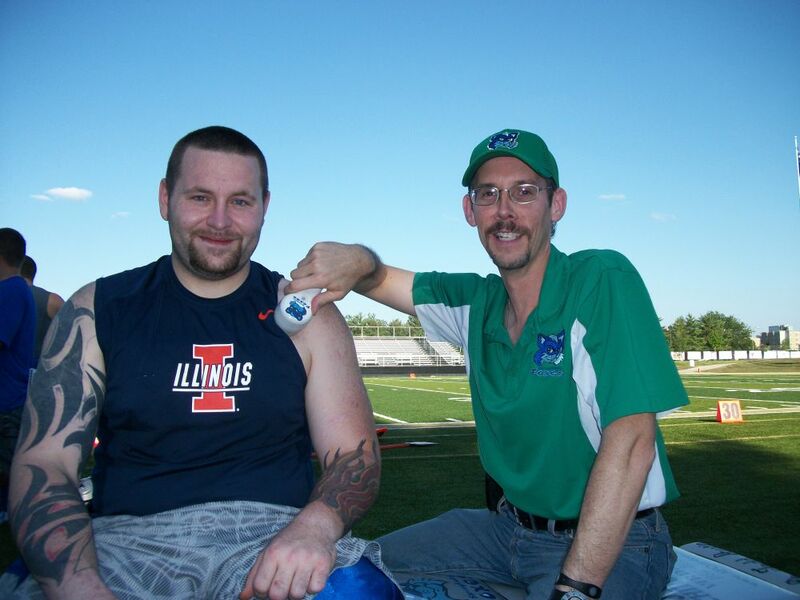 From the looks of this photo, you might assume that Dr. Todd was cold lasering this young man for a shoulder injury. You would be wrong. See the video below to find out what Travis, a semipro football player, was actually being lasered for. Dr. Austin uses Cold Laser Therapy for an upper extremity issue on a football player. Due to Dr. Todd’s work with the Foxes as Official Team Cold Laser Therapist from 2013 to 2015, he’s had the wonderful opportunity to help players who have had serious knee injuries (torn ACL, MCL, Medial Meniscus and/or patellar tendon) pre and post-surgically along with some of the finest Sports Medicine M.D.s and Orthopedic Surgeons in the area. One player who suffered a torn ACL was actually in the clinic getting his knee cold lasered less than 72 hours after his ACL repair surgery! He returned to play at 100% in just 7 1/2 months, which is outstanding. 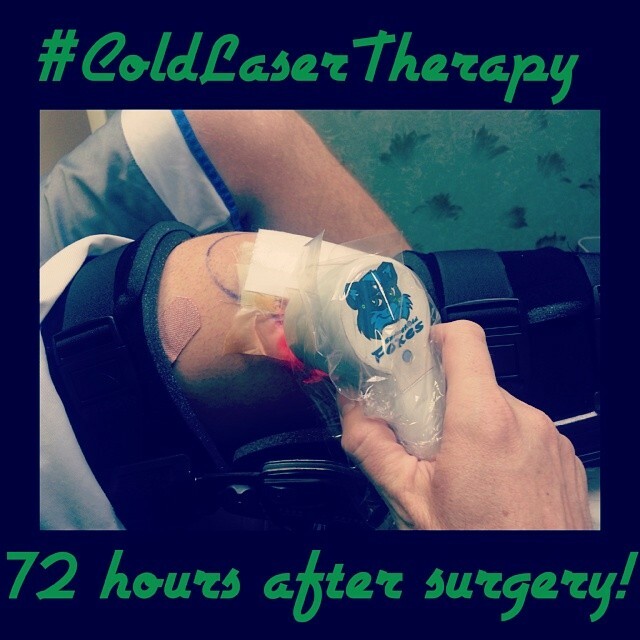 72 hours after an ACL repair surgery, Dr. Todd is using his cold lasers to speed up the healing process. In 2013, Dr. Todd & Eugena also added another form of healing LIGHT therapy to their clinical offerings, that being Biomat far infrared (FIR) thermotherapy. FIR is another state-of-the-art therapy which totally compliments LLLT. Dr. Todd originally used a far infrared mat to help him recover from an inguinal hernia surgical repair in nearly half the time his surgeon told him it would take. Then more recently, one of Dr. Todd & Eugena’s daughters utilized the same FIR technology to recover from her emergency appendectomy in just one third of the time her surgeon told them it would take her! For more informational or to find out if Cold Laser Therapy and / or Biomat therapy could help you, please call Dr. Todd or Eugena at 217-965-3100 or email draustin@royell.net . Please also find and follow them on facebook to find out when their next informational Light Night event will be. At Light Night Dr. Todd & Eugena demonstrate a cold laser treatment on a patient, Gena discusses how Light Therapy assisted her with her 80 lb weight loss, they let all attendees try out a Biomat and they explain the Light therapy technologies. The program then concludes with a Q & A session. It’s a FREE event with is held periodically on Thursday nights at their clinic. 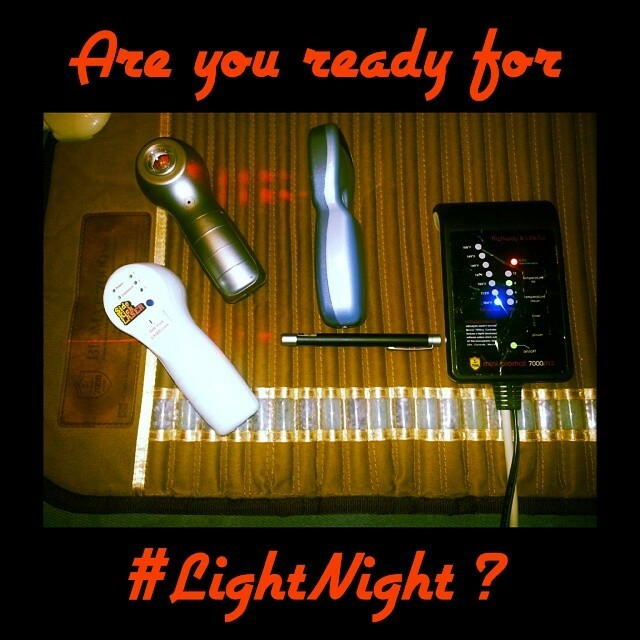 Stay tuned for more details on upcoming Light Nights.